parts in this titanic tussle. Man oh man oh man. Coach Austria must be thanking the stars and singing praises to the high heavens. That was a close one. Maybe a little too close. But Alex Nuyles still hit the go-ahead shot. 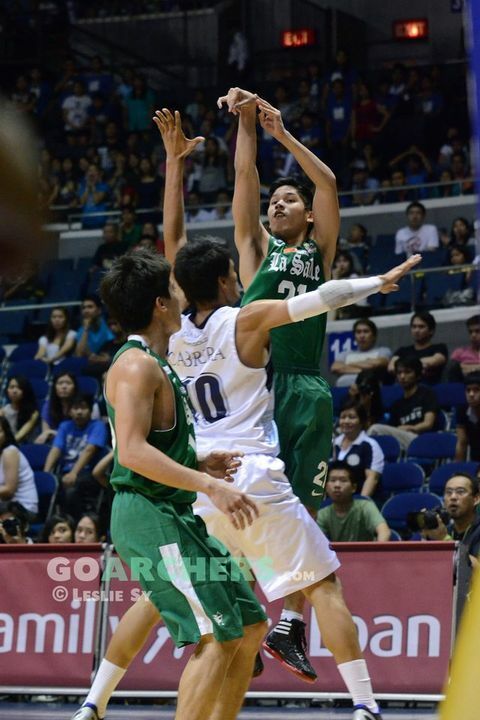 He still tapped the ball just in time to avert a last-second alley-oop by Luigi dela Paz. 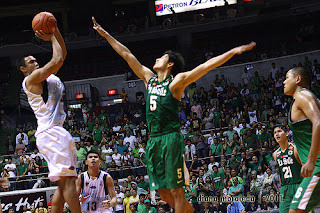 He still ensured the Falcons would sweep the Green Archers this season – unless they pair up in the Final Four (let’s not get ahead of ourselves now). But credit has to be given to La Salle for a brilliant fourth quarter. Their defense turned it up a notch and Adamson fumbled and tumbled, almost enough for a monumental collapse. At the same time, however, the Archers have to be faulted, too, for a horrendous second quarter that put them just a tad too far behind. Two points in a quarter. Wow. Bad luck or bad play? Or a bit of both? With his bench coming alive in the 2nd half, coach DIndo Pumaren almost completed the comeback win. The guys who showed the way? The league’s number one sniper Luigi dela Paz, jump-shot-happy Norbert Torres, and erstwhile underachieving floor general Almond Vosotros. That trio combined for a total of 39 points, more than double the output of Gang Green’s starting five. Their sublime crunch time play, along with the Falcons succumbing to the DLSU press, enabled the Archers to level with Adamson, and set up the dramatic finish. Torres hit a big shot, dela Paz hit a big shot, Vosotros hit big shot after big shot. They just came up short after Nuyles hit the biggest shot. The Shot, courtesy of King Falcon Alex Nuyles. Before I close out this post, though, here’s a commendation for much-maligned coach Pumaren. He did a bang-up job keeping his boys motivated despite Adamson’s great performance. The two plays he drew up for dela Paz (the first one where he hit a corner three to tie it and the last one where he could’ve made a game-tying basket) were both brilliant. They were executed well, too. Adamson just got there in time at the end. 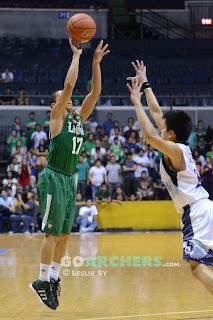 Luigi dela Paz hit some big shots in the clutch. But, man, what a great game. Adamson surges to 6-2, idle second behind equally idle Ateneo, while La Salle drops to 4-4, in a tie with both FEU and UST, but these two teams aren’t far apart in terms of level of play. Adamson, however, looks to have the tougher schedule this week as the revitalized NU Bulldogs and the dangerous FEU Tamaraws certainly have interesting things in store for coach Austria’s wards. 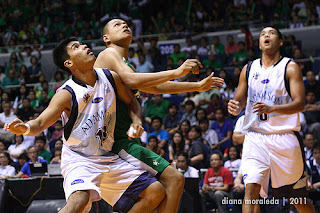 DLSU, meanwhile, should go up to 5 wins when it takes on UE on Saturday. Adamson was barely better in this game, and they’ve been barely better for two games now against La Salle, but my gut tells me this budding Season 74 rivalry ain’t over yet. Lester Alvarez may yet meet the Green Archers in the Final Four.